Tony was at the King George V Parks, in Renfrew, to give his backing for two youth football tournaments being hosted by Renfrewshire Leisure next month that will be played on their pitches in Paisley and Renfrew. And he told how, as a 13 year-old, playing for Possil YM in a youth tournament organised in England, he was devastated by that damning verdict on his chances of realising his dream of being a professional footballer. But Tony proved that coach wrong, as only four years later, then club manager, Alex Ferguson, made him captain of St Mirren. He went on to have an illustrious career, winning the Scottish Cup for The Buddies, signing for Bristol City, captaining the Scotland under-21 side and winning a Scottish League cap against Italy. He also became a respected coach and then manager of St Mirren. 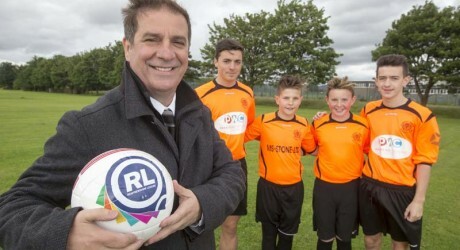 The youth football tournament that Tony is supporting kicks off with a seven, five and four-a-side tournament for youngsters aged between six and 11 years of age, being held on August 1 and 2, at St James Park and Ferguslie Sports Complex, in Paisley. Around 1,200 players are expected to take part. And the second, held on August 7, 8 and 9, is the Glasgow City Cup 11-a-side tournament for players aged between 12 and 19, which will see as many as 1,500 players on the pitches at Renfrew’s King George V Parks. Tony recalled: “Youth football tournaments are fantastic, but I was shattered when I came home after that competition and I’d been told I’d never make it as a pro footballer because I was to wee and thin. “I’d been recommended by a Scottish scout at the time, Joe Hill, and I and some other Possil YM players were being looked at during the tournament. “I was devastated to be told I wouldn’t make it because I’d always dreamed of being a professional footballer. It took me quite some time to get over that, but it brought out the mental toughness in me you need to make it as a footballer. Tony has some good advice for the youngsters taking part in the football tournaments. “These games are a great chance for young players to show what they can do,” he said. “There will be scores of football scouts from all over the country coming to see the games. “And don’t get hung up about your size. You don’t need to be a giant to make it in football. Just look at Lionel Messi and David Silva – these guys are all well under six feet tall. One of the tournaments organisers, Mitch Agnew, said: “These are two of the biggest youth football tournaments in the country and it’s great pre-season preparation for everyone taking part. Chief executive of Renfrewshire Leisure, Joyce McKellar, said: “We’ve got some great facilities for football and the parks are looking great just now.